Friday, April 8, 1859.Bloomington, IL. In court Lincoln is occupied with case involving Bloomington Gas Light and Coke Co., which had been sold under mechanic's lien. Lincoln is one of counsel for purchaser, who is resisting motion to set aside sale. Bloomington Pantagraph, 13 April 1859. In evening Lincoln is scheduled to lecture on Inventions, but audience is so small engagement is cancelled. 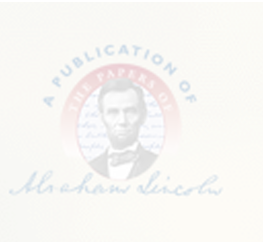 Bloomington Pantagraph, 6 April 1859, 9 April 1859, 13 April 1859; IHi—Journal, XXVIII, 96-7; Sherman D. Wakefield, How Lincoln Became President: The Part Played by Bloomington, Illinois, and Certain of Its Citizens in Preparing Him for the Presidency and Securing his Nomination and Election (New York: Wilson-Erickson, 1936), 101-2.